Have you ever gotten a pimple? Of course you have, you zit-riddled monster! Like many acne sufferers, you too probably turned to the commercial smorgasbord of topical acne treatments hawked by celebrities and clear-skinned teenagers from a parallel universe where everyone is attractive at every stage of development. When that topical treatment inevitably failed, you too most likely wondered aloud to the capricious epidermal gods, "O why do I have acne, I, who have never committed genocide or petty theft, I, who have never once done anything wrong? It's just NOT FAIR!" After all that petitioning and praying and cream-applying, science has finally figured out why YOU get acne while other humans get to enjoy the sorts of pool party orgies that only clear-skinned people get invited to. Or, science has very nearly figured out why some people get acne and others don't. According to LiveScience, a study published Feb. 28 by researchers at the David Geffen School of Medicine at UCLA found that, though everyone has a unique mélange of pimple-causing bacteria, only one in five people will develop acne in their lifetime. As part of the study, the UCLA team used pore-cleaning strips to collect acne-causing (Propionibacterium acnes) bacteria from about 100 volunteers, half of whom were pimply. From the samples, researchers led by Huiying Li sequenced 66 strains of P. acnes, singling out two strains in particular that were found way more often on the Swiss-cheese noses of acnified volunteers than on the noses of their clear-skinned counterparts. 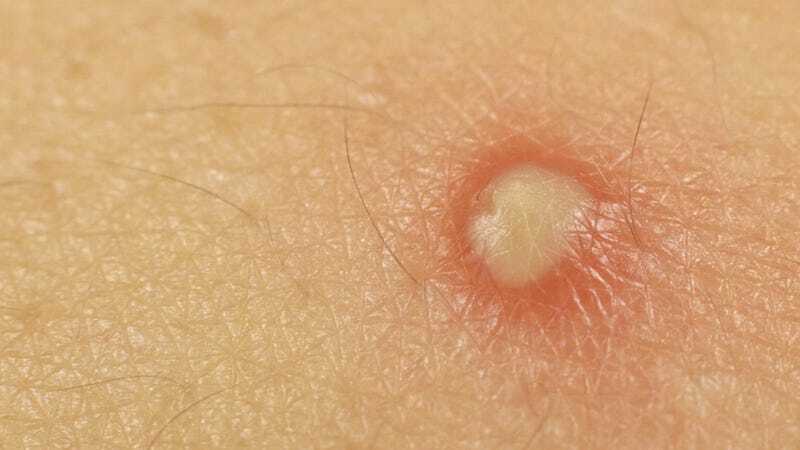 Moreover, researchers identified a third strain of bacteria more common to clear-skinned volunteers. This third strain, explained Li, may contain "a natural defense that enables it to recognize attackers and destroy them before they infect the bacterial cell." If that all sounds very Body Wars to you, then consider the possibility that, by identifying the so-called "good" strains of P. acnes, researchers believe they might be able to develop a cream that would actually clear zits up forevsies, which would lead to the democratization of pool party orgies everywhere.